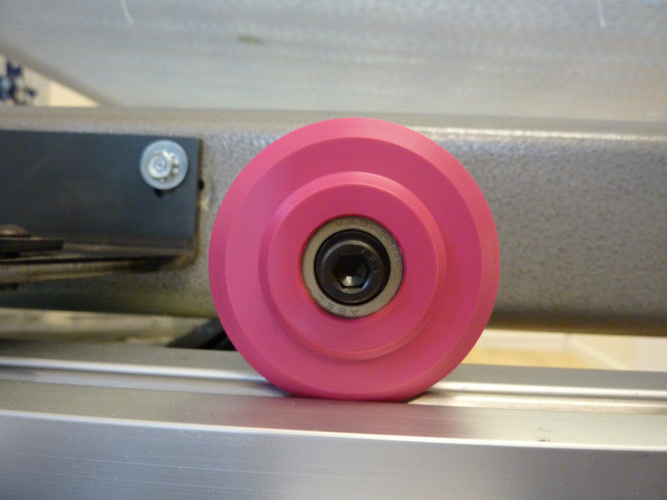 We just released our Limited Edition Pink wheels for Gammill Quilting Machines. 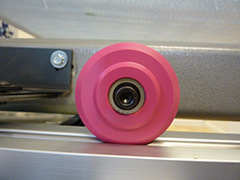 The new Pink Gammill wheels are $250 and we will donate a percentage of each sale to the Susan G. Komen for the Cure®. (http://ww5.komen.org). Shipping is free to the continental US. We have the same one year full warranty as all of our other products. Contact your dealer for more information! 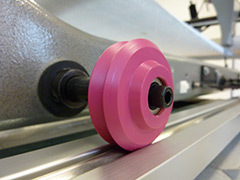 You can only purchase EdgeRider Wheels for APQS Quilting Machines through our authorized dealers. If they do not have the authorized dealer logo they are not selling you the Genuine EdgeRider Wheels. View the list of our dealers and contact them to purchase your set. Imitation SHOULD BE the sincerest form of flattery! It happened again. A small company (us) spends several years developing and fine-tuning a product then a large company (Gammill Quilting Machine Co.) re-engineers our design as if was their own. They not only end up selling it for a higher price but also manage to use it in a way that affects the performance of your quilting machine. To make things worse, their dealers and corporate staff have also been using our product name "EdgeRider Wheels" when referring to "their" wheels. In effect, they are trying to fool their customers into believing they are buying genuine EdgeRider Wheels instead of an imitation. So how good are these wheels marketed by Gammill Quilting Machine Co.? 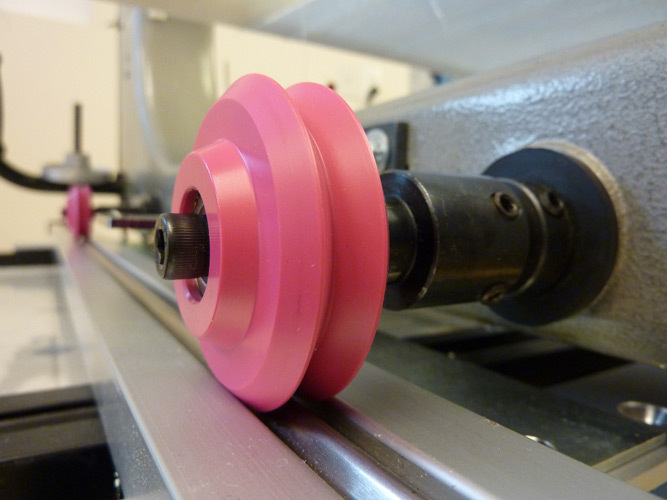 Independent performance comparisons of genuine EdgeRider Wheels and wheels provided by Gammill Quilting Machine Co. show that Gammill wheels are not as free flowing as genuine EdgeRider Wheels. The wheels provided by Gammill Quilting Machine Company make intricate and precise stitching more difficult and the Gammill wheels do not slide smoothly on a diagonal, slipping along one axis after coming to a stop on the other axis. A simple test with a glass of water shows how much less vibration your machine has with genuine EdgeRider Wheels. One customer told us that when using Gammill wheels, she felt like she was "man-handling" her machine just to get it to perform according to the quilting design. We were led to believe that Gammill Quilting Machine Company wanted to work with us. In 2008, Gammill approached us to provide them with our wheels for their quilting machines. This seemed like a great idea at the time. Finally, Gammill Quilting Machine Company has realized how our superior product can improve their quilting machine performance and at the same time make their customers happy. This would help them sell more machines! When Gammill Quilting Machine Co. contacted us for a quote, they only wanted to use two wheels per axis, four total, per machine. We explained that this would not work well and all eight wheels were needed for the smooth ride our customers enjoy today. We even offered to develop a design specifically for their needs. Their representatives responded that their engineers had already determined that four wheels (two per axis) were adequate. We were not willing to compromise our quality for anybody, not even a big company like Gammill Quilting Machine Co.. They did end up asking for a quote for sets of eight wheels and ordered a sample set from us. Much to our surprise, for some reason our wheel did NOT work for them despite the fact over a thousand quilters were, at the time, using genuine EdgeRider Wheels on the Gammill machines as a performance enhancing after-market addition. Work with a company you can trust. We are constantly working to provide the best product for your quilting machine. Make sure you are buying genuine EdgeRider Wheels, not an inferior imitation, by contacting one of our dealers. If they are not on our list they are not selling EdgeRider Wheels. Our Gammill and APQS sets cost $160 and come with 8 quality wheels and all the parts you need for installation including step-by-step instructions. Contact our dealers to buy genuine EdgeRider Wheels and save yourself some money and headaches. Don't let your machine ride on anything but genuine EdgeRider Wheels. 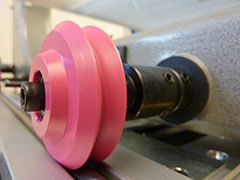 We make wheels for quilting machines. We are the only company that engineered its wheels specifically for the quilting industry. Most long-arm and mid-arm quilting machine manufacturers buy their wheels from other industries. Would you let your car ride on bicycle tires? Don't let your quilting machine ride on pulleys. Video by Debra Pugh, The Quilters Touch, www.thequilterstouch.com. Videos by Debra Pugh, The Quilters Touch, www.thequilterstouch.com. Use our product selector tool to find the right set for your machine before contacting one of our dealers.